Still somewhat of a curiosity, but emerging into the mainstream, it was a device of considerable mystery and no little derision. 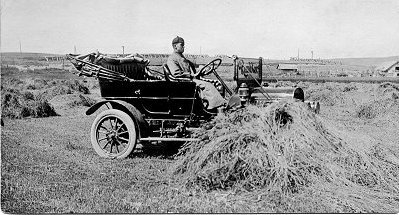 In 1906 he took a job with P. J. Downes Company of Minneapolis, distributor of Rambler automobiles. 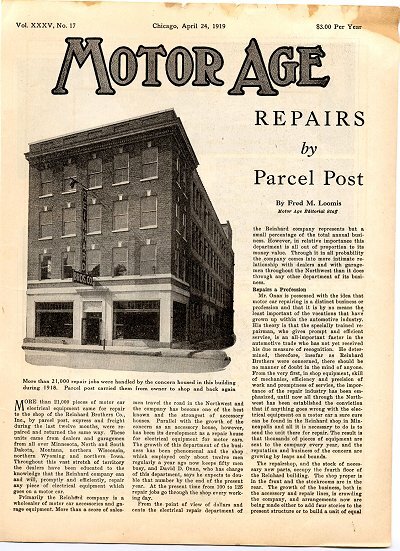 When an auto was sold frequently someone had to be taught how to drive and service it. 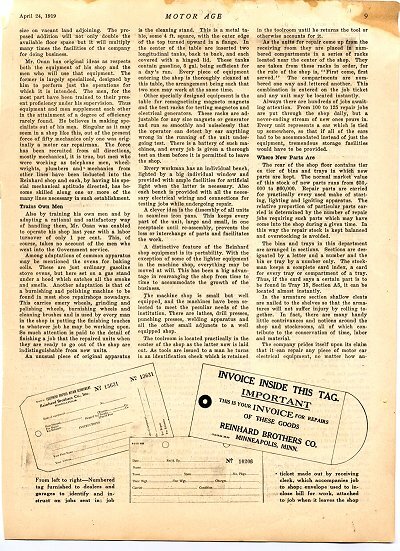 One instance was the Heffelfinger family of Ferndale, Wayzata MN. 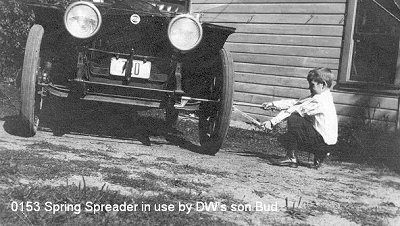 DW lived with the stable master at Highcroft estate for a week while he taught him how to drive and service the car. Another situation was the delivery of a new auto to a Montana customer. Presumably he and the car went by train to the closest point where it could be delivered on its own wheels. The picture below is D. W. Onan going cross country in the Judith Basin of Montana. This was greasy hand, skinned knuckle sort of work that gave Dave an intimate knowledge of the automobile. It not only taught him how things worked, but what did and what didn’t. Auto engineering was pretty much empirical, cut and try. Apparently his mind worked well in this area and he learned quickly. The Spring Spreader came directly out of a need. 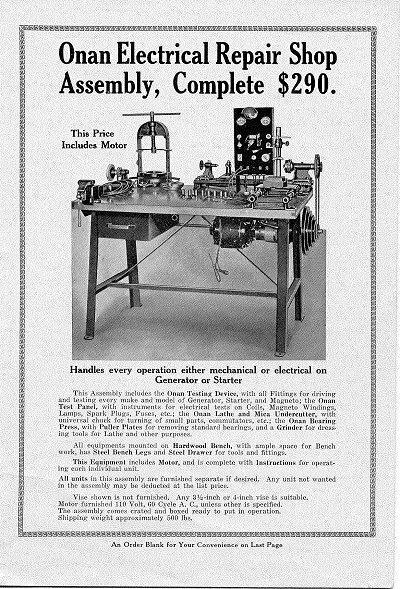 In about 1917, the patent application is not dated, he developed this device which spread the leafs of the spring apart and applied grease between them. It was all contained in one tool, as demonstrated by his son, Bud, then 10 years old. 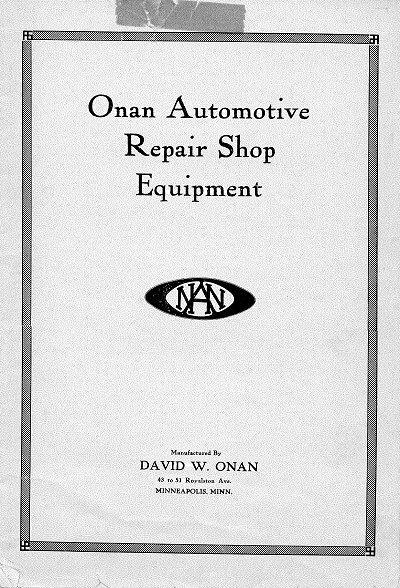 By 1919 he was well established at Reinhard Brothers running their auto parts repair shop. This involved management skills, including planning and scheduling; and personnel supervision. 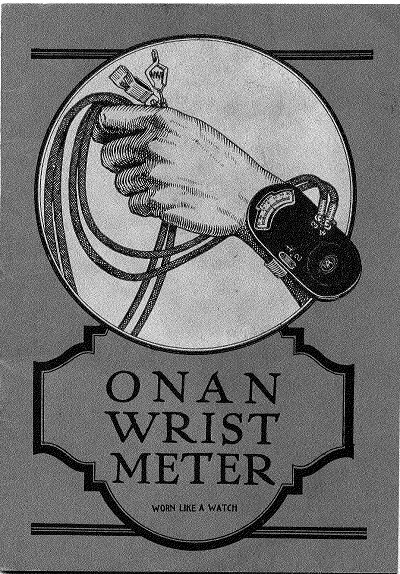 The Wrist Meter in 1921 was directed at the new era of auto electrical problems. 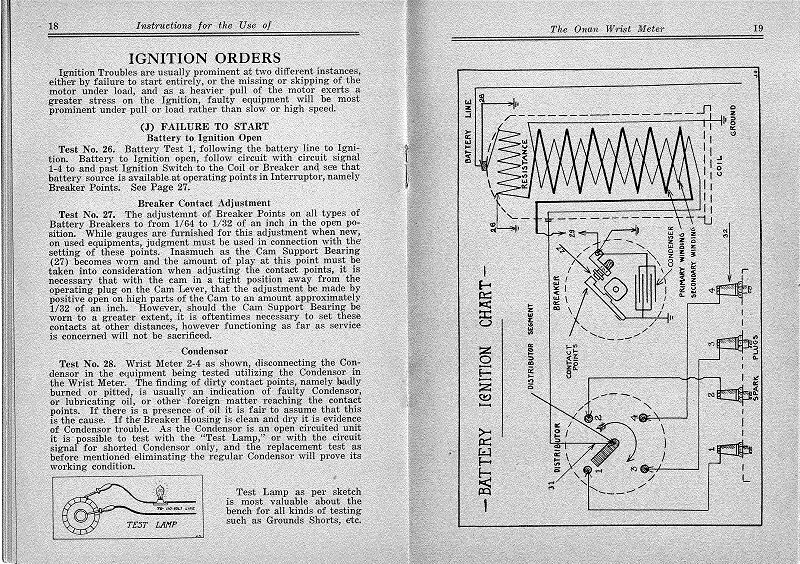 Not only was the engine ignition system electric, but there was the “chassis electric system” which included lights and electric starting. 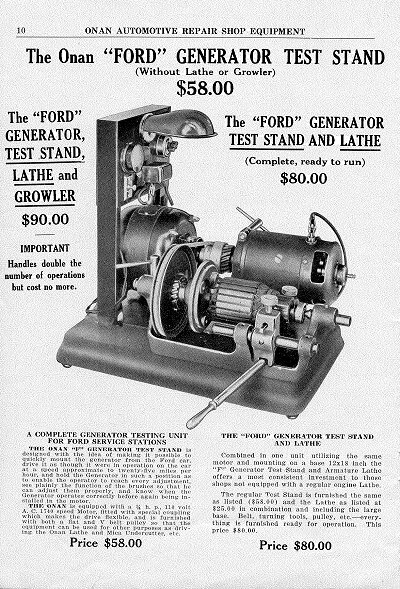 The first electric starters were installed as “after-market” accessories because the auto manufacturers were not all adopting it immediately. Electric starting meant the lady of the family could now use the car, and she was anxious to do so. But dependable electric equipment was a ways in the future. The auto mechanic with an electric problem was usually looking at a one of a kind installation and needed tools to diagnose problems. 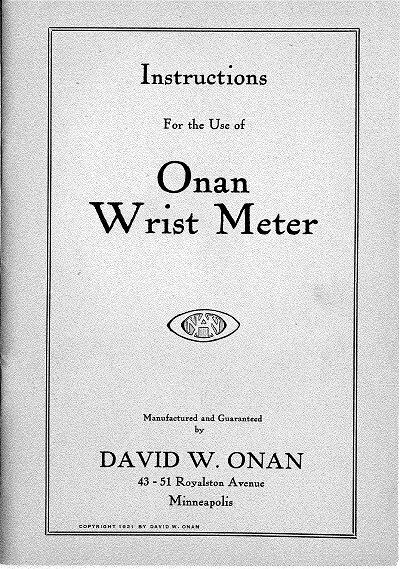 The Wrist Meter was intended as the all-purpose diagnostic tool. And it could be carried to the source of the problem and used by the mechanic right on the spot, often avoiding sending parts by mail for repair. But as any techie will tell you today, new stuff is baffling. Dave also had to write instructions for use. 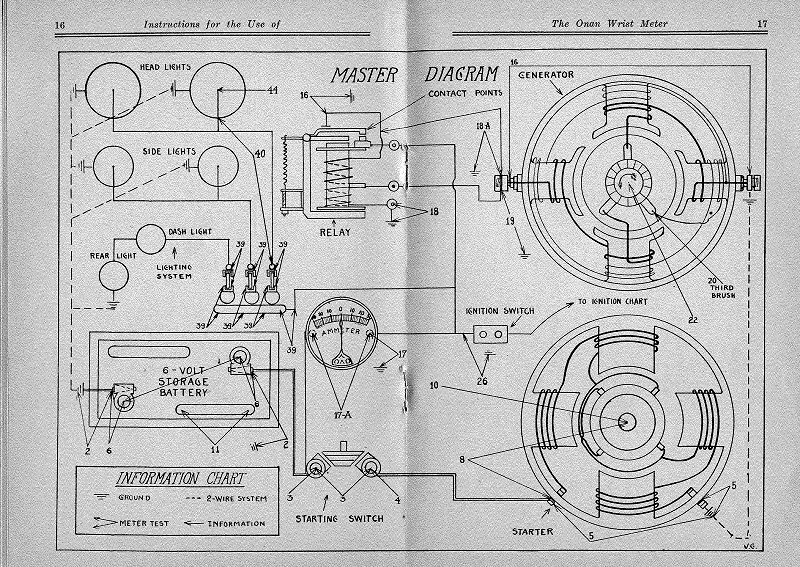 Here are a few of the 37 pages in the instruction manual. We don’t know how Dave acquired all the technical knowledge. 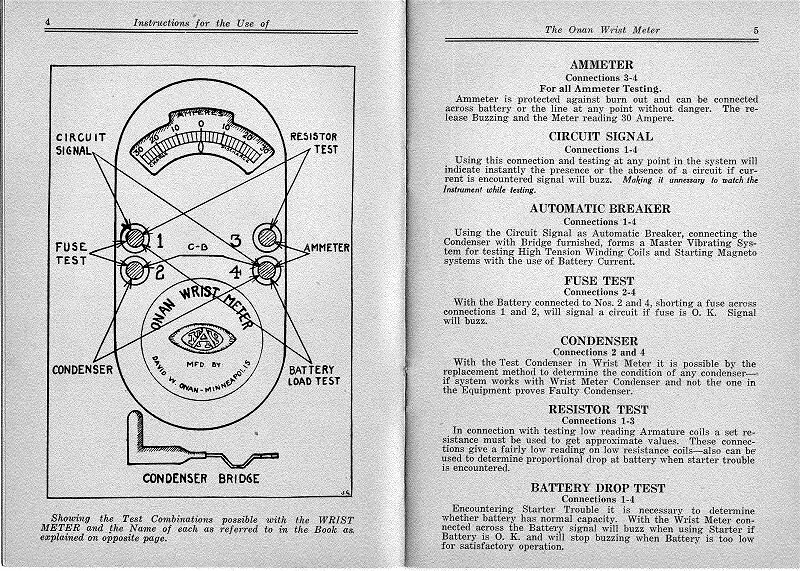 The meter was a very sophisticated instrument for its day, and the technology was rapidly evolving. The drawings were professionally made. 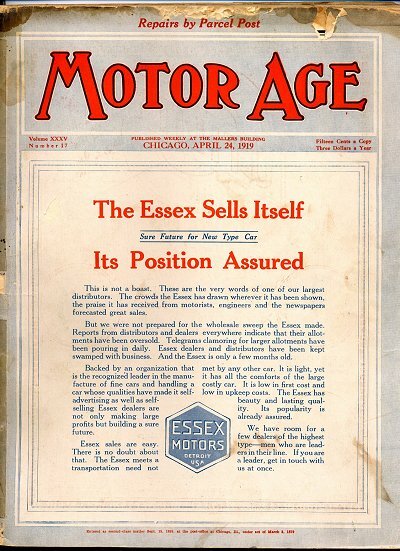 Material, heat and design made early auto electric parts subject to failure. When the Wrist Meter diagnosis indicated repair in-situ was not possible, the part was removed and taken to the bench for work. Dave built the bench test equipment Reinhard Brothers used. His agreement with them allowed him to sell it to anyone. The nature of the test equipment was that it had to simulate running conditions. 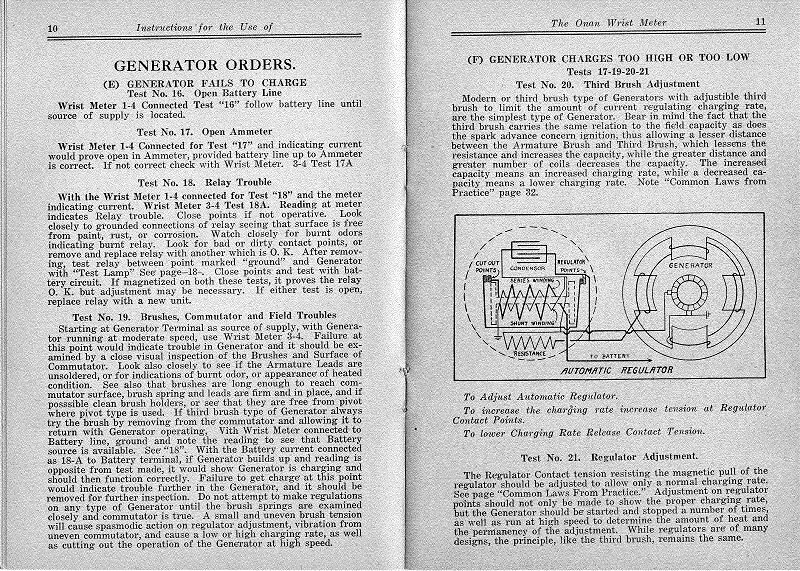 Motors and generators actually had to spin or be spun on the test stand. 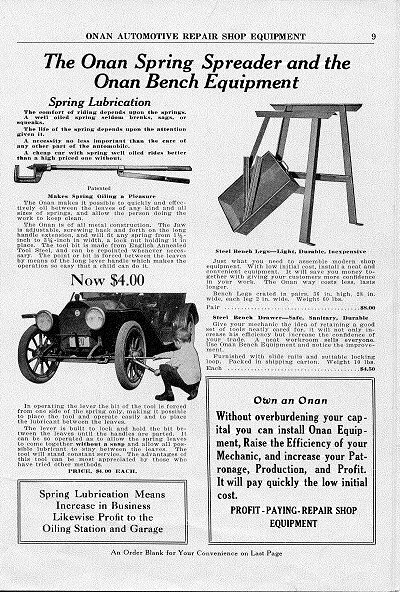 In additions to the pages shown, there were lathes and supports that held the parts while major repairs to be made. 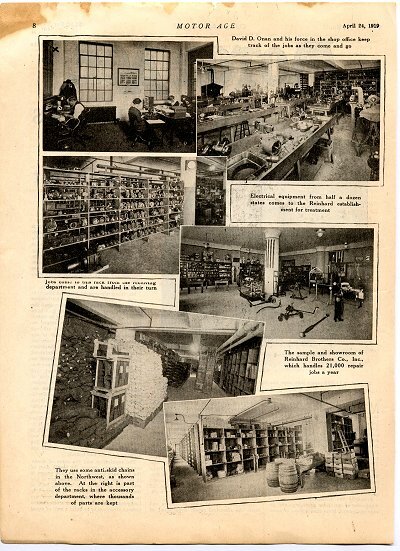 What follows are a few of the 14 pages from his from his 1924 catalog.